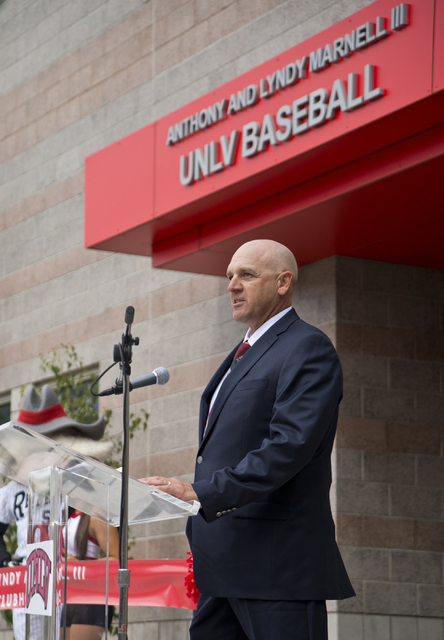 When Stan Stolte was officially named UNLV baseball coach in June, he said one of his goals was to keep the best Las Vegas players at home. He’s on his way to realizing that goal after the Rebels recently signed five locals to their 2017 recruiting class and received verbal commitments from five locals to their 2018 class as well. 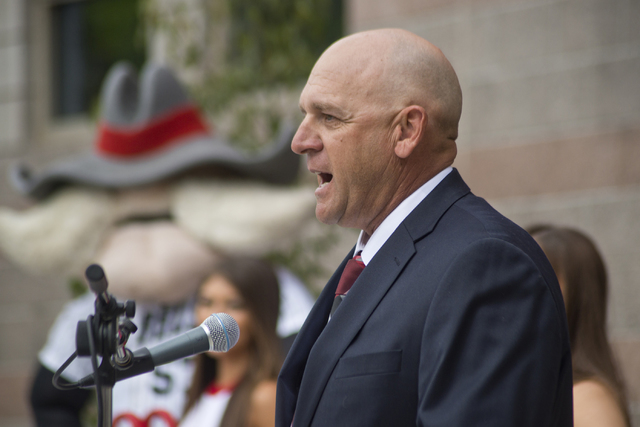 When Stan Stolte was named UNLV baseball coach in June, he said one of his goals was to keep the best Las Vegas players at home. He’s on his way to realizing that goal after the Rebels recently signed five locals in their 2017 recruiting class and received verbal commitments from five locals for their 2018 class. The five Southern Nevada signees are second baseman Dillon Johnson (College of Southern Nevada, Silverado), right-handed pitcher Cade Adams (Desert Oasis), infielder/pitcher Bryce Bullock (Spring Valley), infielder Jacob Rogers (Liberty) and first baseman/outfielder Jack Wold (Basic). The five commits are right-handed pitchers Jacob and Jaret Godman (Cimarron-Memorial), shortstop Duke Pahukoa (Durango), center fielder Jake McLean (Coronado) and right-handed pitcher/utility man Austin Pfeiffer (Arbor View). UNLV essentially lost one year of recruiting because of the coaching transition from Tim Chambers to Stolte. He was named acting coach in December 2015 following Chambers’ resignation but didn’t have “acting” removed from his title until after the 2016 season, when he was given a three-year contract. However, recruiting appears to be back on track under Stolte, assistants Kevin Higgins and Pat Armstrong and volunteer pitching coach Greg Maddux, a Baseball Hall of Famer. Stolte is high on his 2017 class, which also features a trio of pitchers expected to contend for starting spots in the 2018 season in junior college transfers Trevor Horn (Scottsdale (Ariz.) Community College) and Donavon McCrystal (Grossmont College, El Cajon, Calif.) and high school senior Conner Woods (Marcos de Niza, Tempe, Ariz.). “Even though each class is of the utmost importance, it was critical that we put a class together that will put us in a position to win nationally again and I’m very confident we accomplished that,” Stolte said. Johnson is expected to make an instant impact for the Rebels, who went 24-32 last season (14-16 Mountain West). A first team all-state selection at Silverado, he hit .353 for the Coyotes last season. The 6-foot-4-inch Adams is expected to be fully recovered from Tommy John surgery when he steps on campus. Bullock hit .490 last season en route to second-team all-state honors and grew up wanting to be a Rebel, as did Rogers, an All-Sunrise Region selection. Wold earned first-team all-state honors while helping Basic win the state title last season. “Jack is arguably the best high school hitter in the state,” Stolte said. Maddux, a four-time Cy Young Award winner, inherits a Rebels pitching staff that has to replace 80 percent of its innings from last season. UNLV lost its top three starters and closer in the Major League Baseball Draft and arguably its top returning pitcher, Ryan Hare, to Tommy John surgery. As a volunteer, Maddux isn’t allowed to go on the road recruiting but he’s proved a big attraction to the program. “His name right away gets us in the door,” Stolte said. UNLV opens its 2017 season Feb. 17 at home against Nebraska-Omaha.